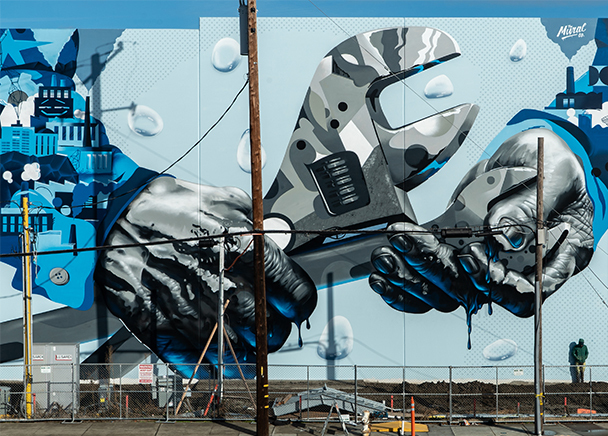 Trammell Crow Company (TCC) and Principal Real Estate Investors announce the unveiling of four murals for San Leandro Business Center, a 553,200-square-foot, 3-building, Class A industrial project located at 100 Halcyon Drive in San Leandro. 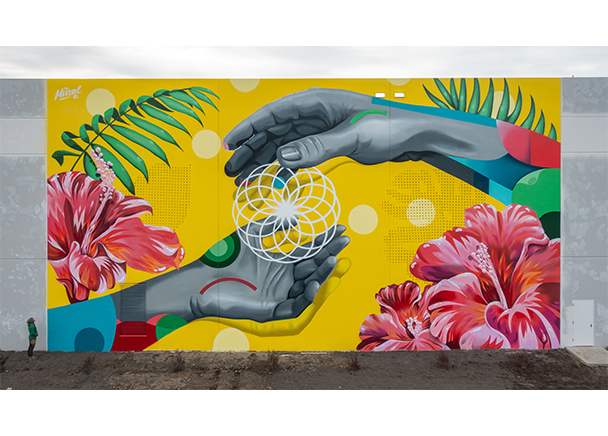 San Leandro Business Center is owned by Principal Real Estate Investors and the four murals, totaling 15,652 square feet—approximately 3,400-to-4,500 square feet per mural—are titled “Hands of Change.” The Mural Co., an award-winning, artist-led national mural agency, was commissioned by TCC and Principal to curate, manage and produce the artwork. 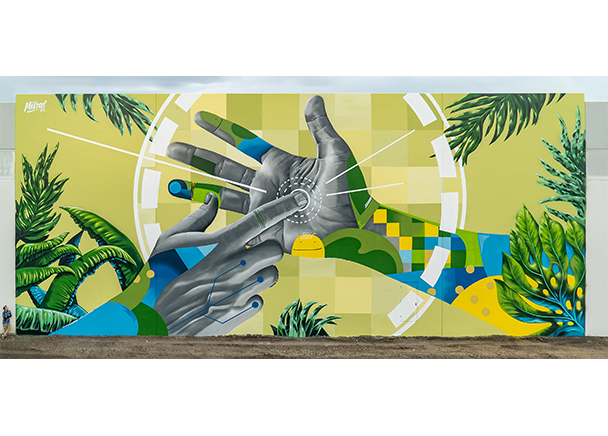 The theme of the murals center around the concept of: hands as a metaphor for people and the community, as well as the four seasons as a metaphor for the local region’s history and natural cycles of change and rebirth. The timeline begins and moves through Pre-Colonial times (Fall Mural), the Industrial Revolution (Winter Mural), the Digital Revolution (Spring Mural), and with a positive view to the future (Summer Mural), combining the wisdom and learnings of the past with our current knowledge, for a brighter future. Building 1 is 121,643 square feet, Building 2 is 137,091 square feet, and Building 3, the largest of the three, is 293,940 square feet. Combined, the buildings will feature 32-and-36-foot clear heights, ESFR sprinkler systems, rear dock loading, and generous car and trailer parking areas. The murals face Halcyon Street, Washington Street, the Amtrak line, and the BART line between San Leandro and Bay Fair stations. 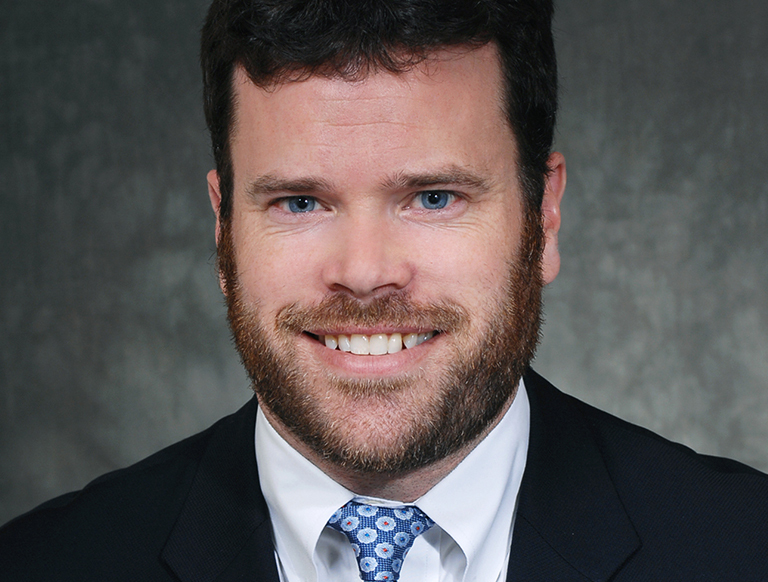 Click on individual images above to enlarge. 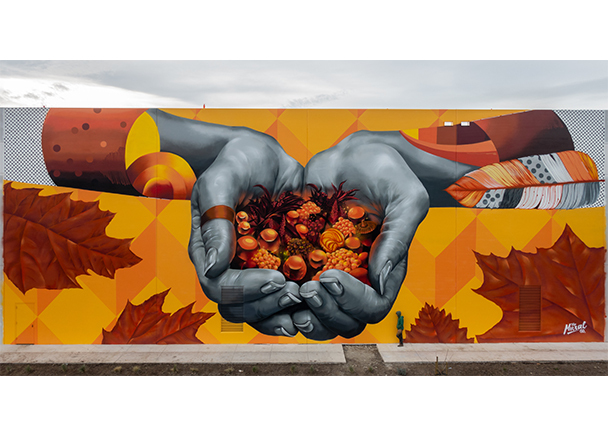 From left to right: The Mural Co.'s Fall, Winter, Spring and Summer.